Claude Monet (French, 1840-1926), “Water Lilies,” ca. 1914-1917. Oil on canvas. The exhibition features fifty paintings by Claude Monet dating mainly from 1913 to 1926, the final phase of his long career, including twenty works from the Musée Marmottan Monet in Paris. During his late years, the well-traveled Monet stayed close to home, inspired by the variety of elements making up his own garden at Giverny, a village located some 45 miles northwest of Paris. 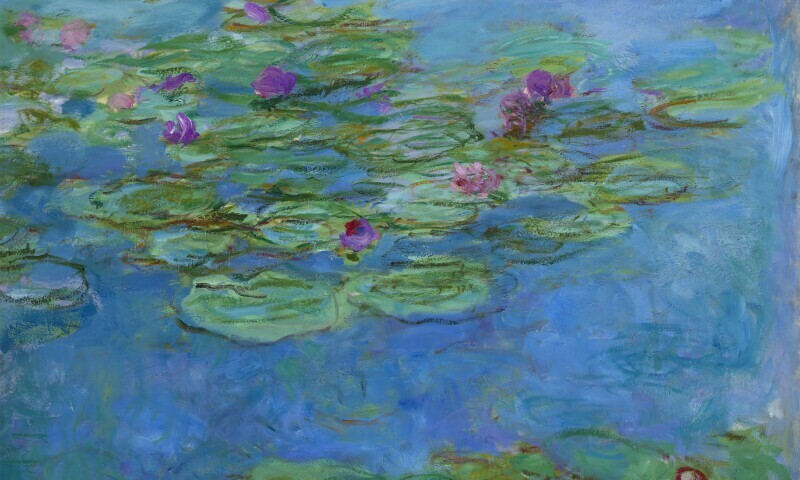 With its evolving scenery of flower beds, footpaths, willows, wisteria, and nymphaea, the garden became a personal laboratory for the artist’s sustained study of natural phenomena. The exhibition focuses on the series that Monet invented, and just as important, reinvented, in this setting. It reconsiders the conventional notion that many of the late works painted on a large scale were preparatory for the Grand Decorations, rather than finished paintings in their own right. Boldly balancing representation and abstraction, Monet’s radical late works redefined the master of Impressionism as a forebear of modernism.